Hakos Asztrofarm, Namíbia, 1835m tszf. 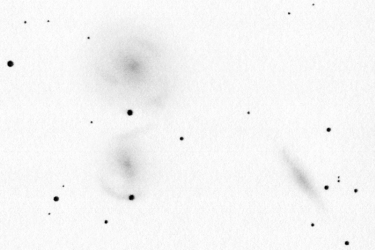 NGC 3293-3324 drawing inverted into positive. This field of view was my only real small telescope objective on our trip to Namibia. I didn't really have access to the 16" scope on our first five nights so I had plenty of time and I didn't hurry. This region, somewhat in the shadow of the Eta Carine Nebula really deserves the attention as you can see breathtaking beauties here. 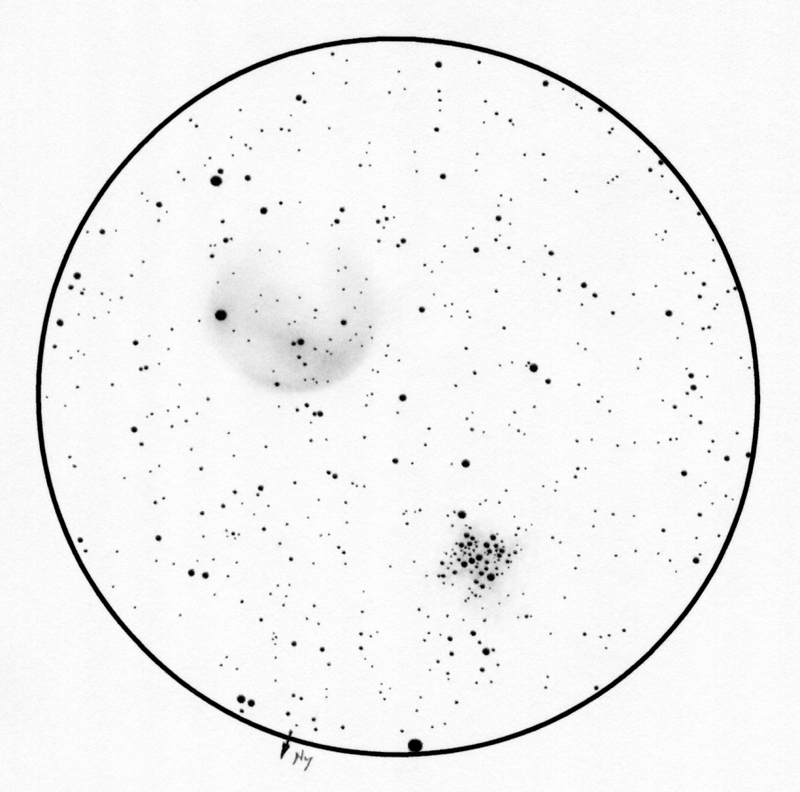 The field of view is clearly dominated by the open cluster NGC 3293. Unfortunately the drawing cannot reproduce the beauty of those dozens of bright stars crammed together into a small 5' area. The cluster is informally called the Gem Cluster. And you cannot find even a similar one in the northern skies. 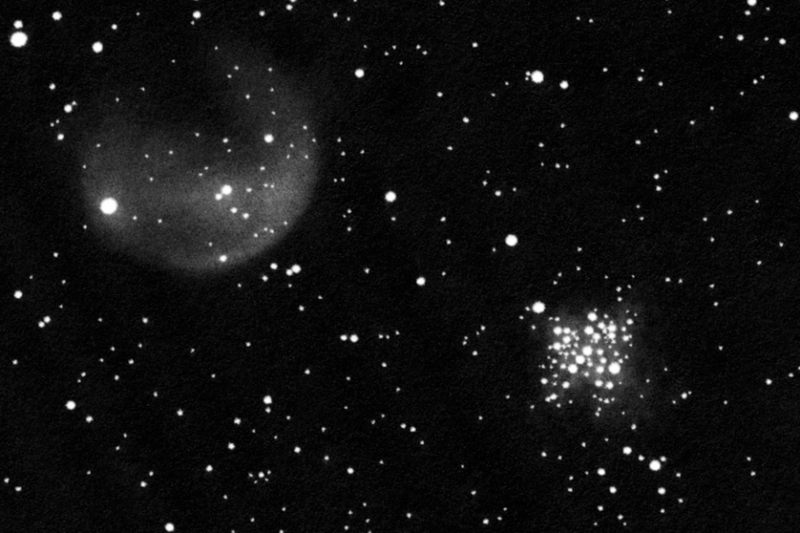 But in the southern skies it has a few rivals like the Jewel Box and NGC 3766. 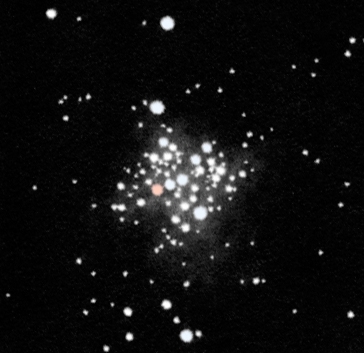 The cluster is composed of young hot massive bluish-white stars mainly with spectral types B. But there is one red supergiant as well: V361 Car. 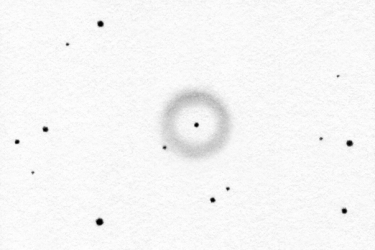 The color of this star can easily be seen in my little Newtonian telescope but it's just pale orange. We took a look at this area in the 25x150 Fujinon binoculars as well. The colors of the stars were stunningly vivid even at first glance. 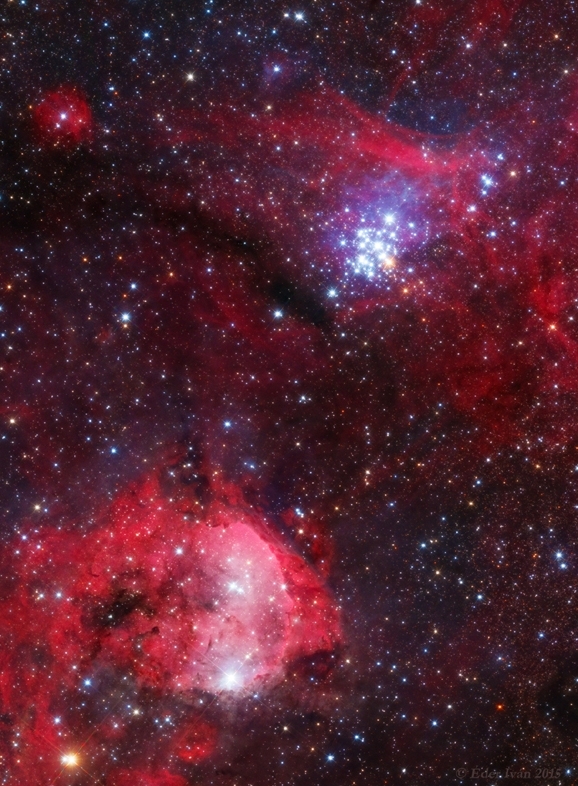 There is a nebula (Gum 30) around the cluster but it is not attached to it physically. I didn't see this nebula. The fine reflexion nebula among the cluster's shiny stars remaind hidden as well. NGC 3293 color, positive drawing. The orange star is V361 Car. The other object in the field of view is the star forming region NGC 3324 with a bubble-shaped diffuse nebula attached to it. 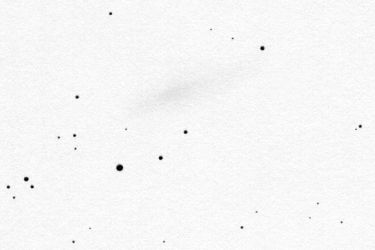 This object is in connection with the Eta Carinae Nebula. 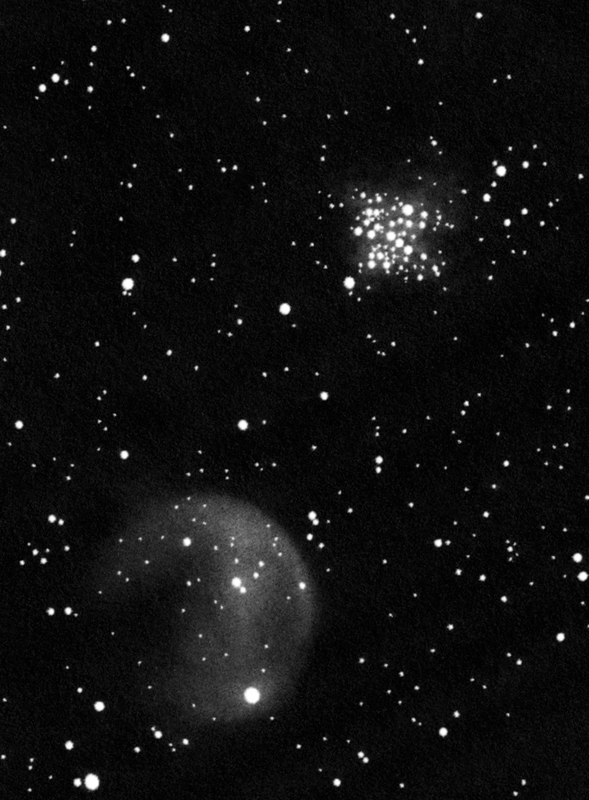 The open cluster NGC 3293 (see above) lies behind them. The bubble of NGC 3324 has a very well defined and spectacular contrasty edge as you can see in the photographs. Suprisingly this edge could sort-of be seen in the little telescope. I saw a thin faint thread at the edge of the bubble. The drawing was made without a filter but I used an [OIII] filter to examine the details of the nebula. The photo on the left, courtesy of Iván Éder was made using a 20 cm astrograph. My drawing has been inverted, rotated and cropped to show a similar area of the sky as Iván's original photograph. As you can see this region is even more spectacular than one could think based on its 4" eyepiece impression. Since we had the opportunity we took a look at this pair with a larger telescope as well. 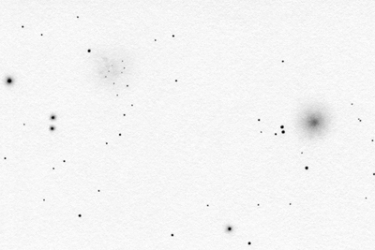 The open cluster is even more beautiful in the 16" Newtonian. 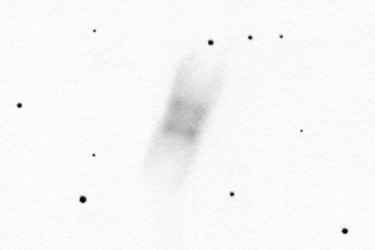 But I didn't manage to spot the fine reflection nebula that hides among the cluster members even in the bigger Dobsonian. It is an interesting experiment to blink-compare the drawing and the photo. 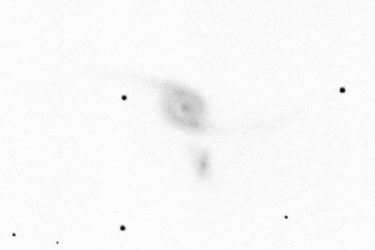 This reveals the precision of the drawing and illustrates the accuracy of my deep-sky drawings in general. An easy way to do this is to open this page in another tab of your browser. Click on the drawing in one tab then on the photo in the other tab to enlarge them both. Then you can switch between the tabs for the blink-comparison. Decrease the size of the browser window If the sizes of the images are different.